I am standing on the steps in front of a stone house built high up on a hill and overlooking the hilly area around itself. The sun is just about to set and it sets ablaze the haze that permeates the hills. Over 640 years ago, at this same spot stood Petrarch (in Italian – Petrarca). He came to this secluded place to spend the last years of his illustrious life and I imagine him looking over at the sunset every night, marking the end of yet another day and, metaphorically, the end of a mission or a life. I was at his spot for all but a minute and he was long gone, but the most amazing thing about Italy is that it brings you unmeasurably closer to people and events that have shaped our world. It felt like I could have stretched my hand and through the sunset reach to over 640 years ago. Emboldened, I asked Petrarch, this herald of the Renaissance, the question that the visit to his house had entrenched in my mind: ‘Who were the women in your life?’. Sadly, there was no reply. Casa del Petrarca is located in a small village high up on top of a hill. Originally called Arqua (with the accent on the last ‘a’), it added Petrarca to its name in homage to the poet, scholar and humanist who died a day shorter of his 70-th birthday in it. We had arrived in Arqua Petrarca, also famous with its stone houses and steep cobbled streets, earlier that same afternoon. 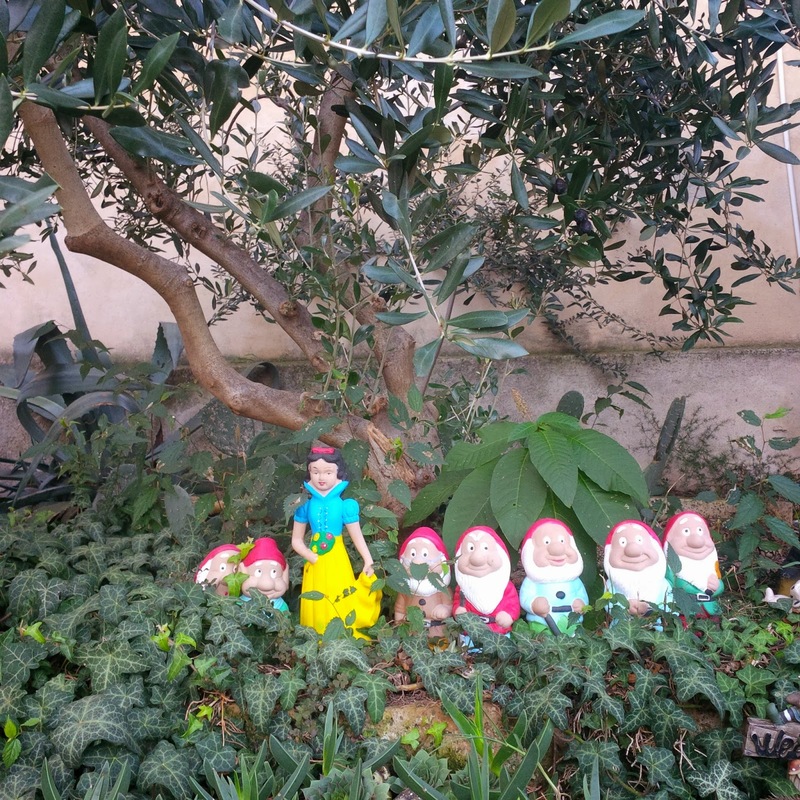 It was Sunday, our day for explorations of Veneto – the Italian region where we now live. We had piled in our little red car and strayed an hour away from our adopted hometown of Vicenza following perfectly straight for miles roads. The haze grew deeper and deeper, depleting from colour the view ahead of us. Then it suddenly lifted from the ground and kept its hold only on the hills that slowly emerged around us. We had crossed into the area of the Colli Euganei, or in English the Euganean Hills – a group of volcanic hills renowned for their beauty and stunning views. 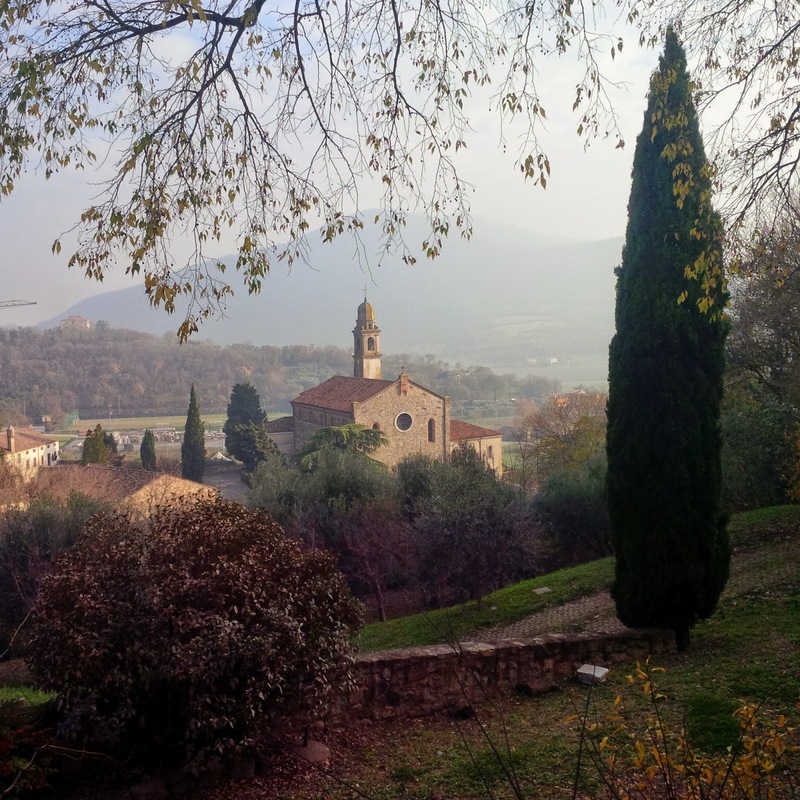 The GPS took us via what looked like a back road, then a sign was pointing us to the upper part of Arqua Petrarca, we followed a winding path and before we knew it we were in the middle of the stone village and parked the car. There was a bruschetteria and further down a gelateria and a cafe. 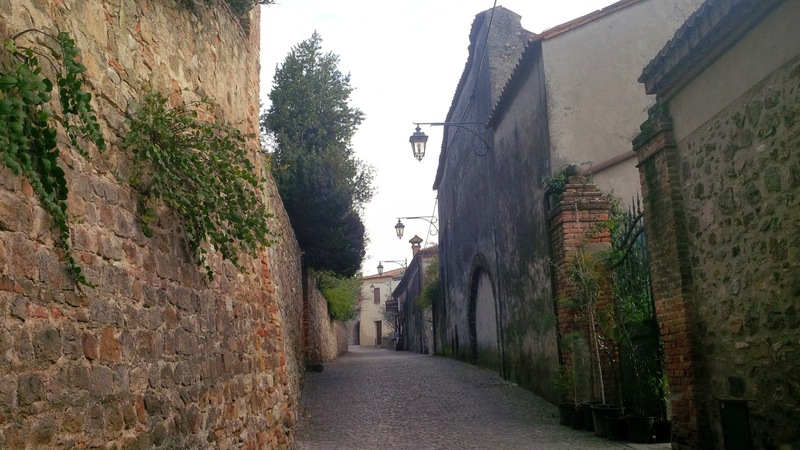 The cobbled streets were steep and without sidewalks. Walking around we realised that the village had been built on some rather steep slopes. As a fortifying measure, the walls of the houses started straight and then halfway from roof to foundations they would suddenly jut out to reclaim a bigger support from the ground. The cobbled main square was the only almost level place. Some of the streets that started from it though, would disappear almost vertically down away from it. We walked down the steepest of them all, holding tightly onto the handles of our baby’s buggy. After a couple of turns, the street took us straight to the parish church of Santa Maria Assunta. Right in front of it and made of red Verona marble is Petrarch’s tomb. It bears the inscription: ‘This stone covers the cold bones of Francesco Petrarch; gather, oh Virgin Mother, his soul, and you, Son of the Virgin, pardon him. May that soul, tired of earthly life, rest in the celestial vault.’. 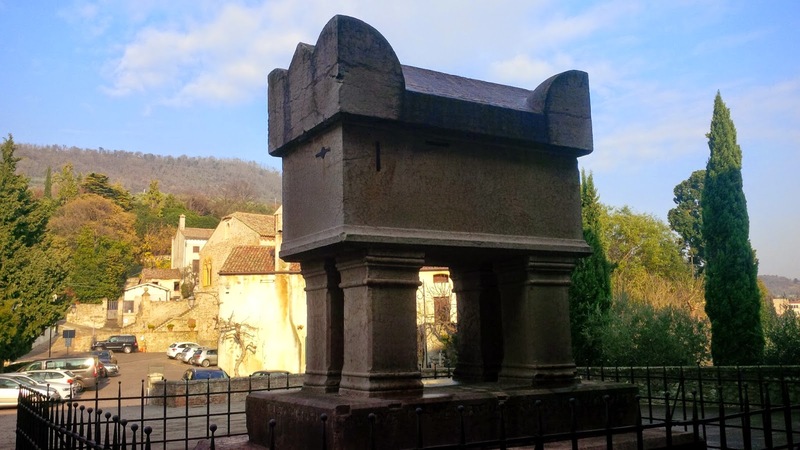 Apparently, since the poet was laid in it in 1380, fanatics obsessed with the cult of Petrarch would make a pilgrimage to it. Through the centuries these fervent fans even managed to open the sarcophagus and removed some of the bones found in it. As you can see, when we were there, things were rather more sedate. 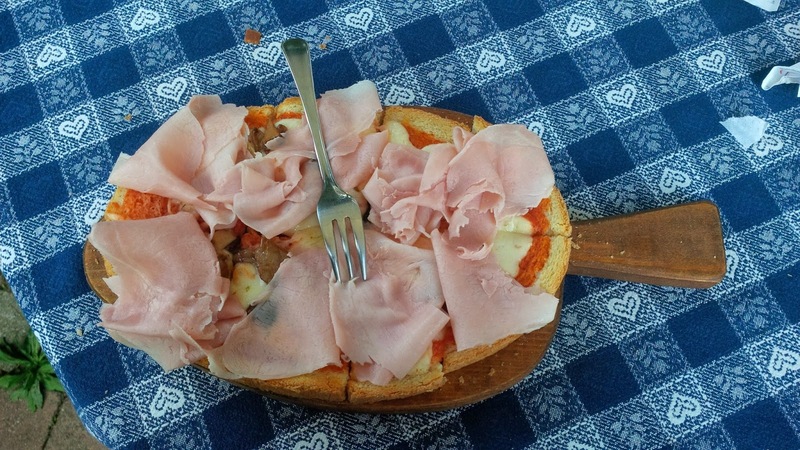 Yes, this is a bruschetta, called Petrarca. My husband ordered panini Laura, but I didn’t feel it made justice to the poet’s one pure love, so I didn’t take a picture of it. After that it was time to visit the house of Petrarca and we climbed the steep streets of the village retracing our steps. The house was not very big and enclosed behind a thick stone wall. It had a lovely garden in front of it, where narrow paths had been formed with the help of ivy bushes trimmed by the hand of a skillful man. Apparently Petrarch himself had been a devoted gardener and spent many hours each day tending the herbs, the trees and the shrubs he planted in the garden at the back. 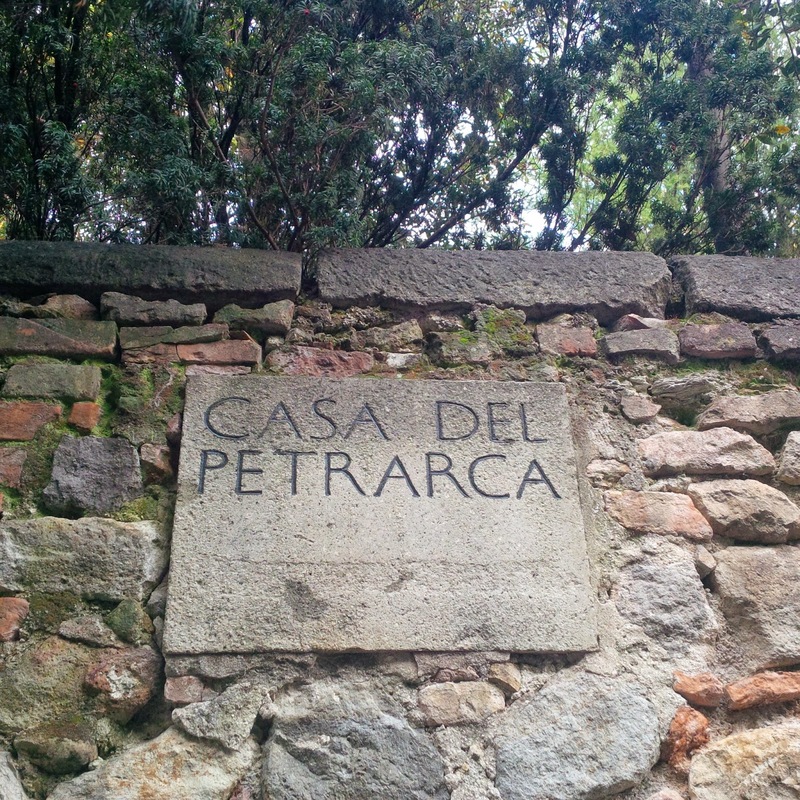 We went up the stone steps adjacent to the stone wall and entered Petrarch’s home. The door on the first floor opened straight into the lounge where the poet would spend his days accompanied by his daughter Francesca, his granddaughter Eletta and his son-in-law Francescuolo. The spacious room was filled with Italians that had come to pay their respects to one of Italy’s greatest sons. In spite of the many people quietly walking around and looking at the artefacts, the room made a huge impression on me. 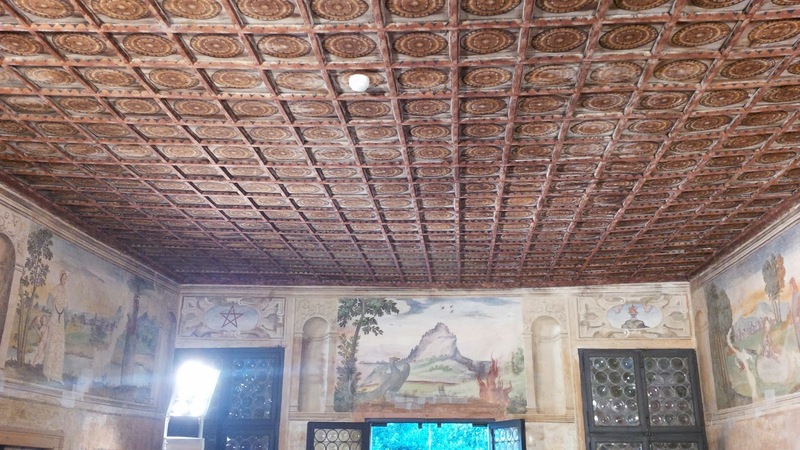 It possessed a beautiful wooden ceiling and at the top the walls were painted with scenes from Petrarch’s works. The latter were added by one of the many owners that the house had after the poet’s death. In the adjacent rooms though, the frescoes from the time of Petrarch can be seen adorning the walls. We saw the study of the poet, his alleged bedroom in the room of Venus, the Egyptian room with a large picture over the stone fireplace of Cleopatra being bitten by two snakes on her breasts. 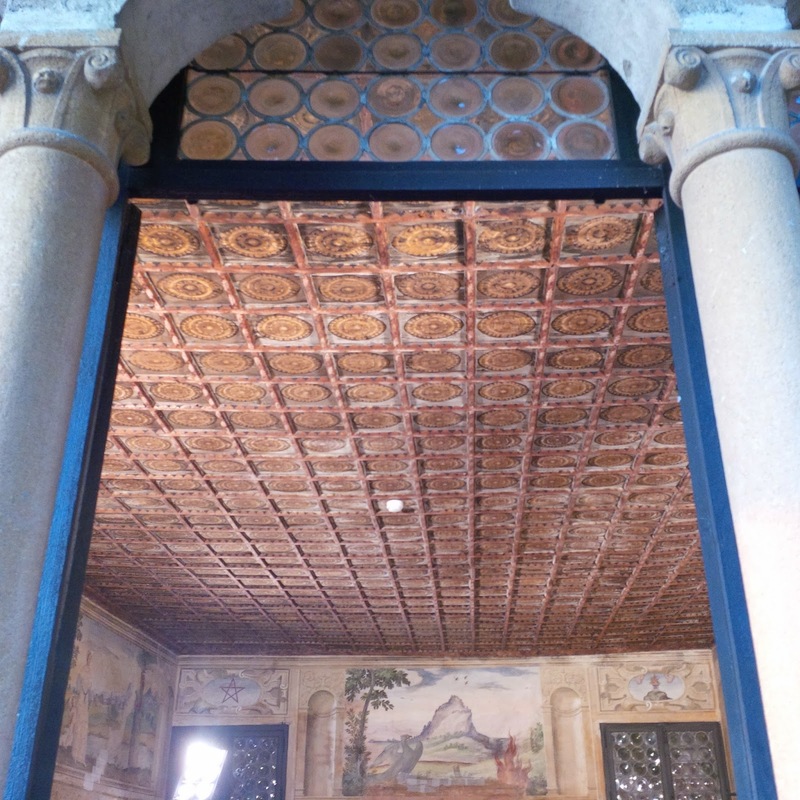 Large boards provided information and people were respectfully moving from one to the next, stopping every now and then just to observe the details around us and, perhaps, to imagine Petrarch moving around in these rooms. This is the last picture I took, before realising that picture taking was not allowed, as which point I put the camera away. 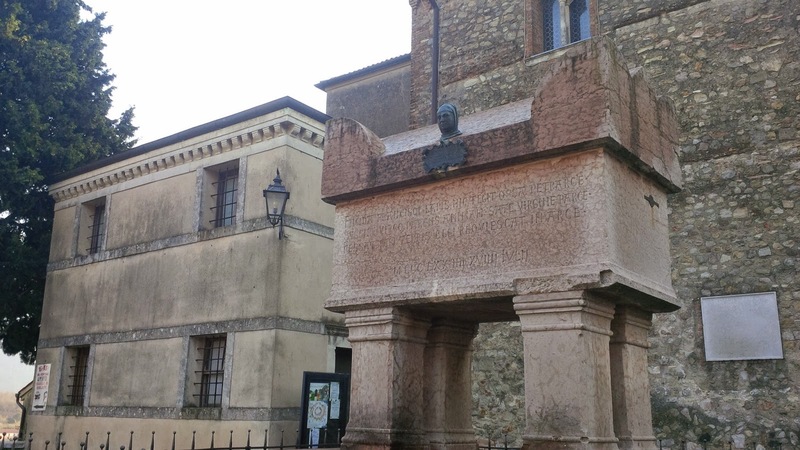 The ground floor of the house had been converted into a museum exploring the life of Petrarch. There is a photographic exhibition tracing his steps through the many towns and cities that he lived in. The embalmed body of allegedly his cat is also in the museum, but it seems, the feline corpse was added by one of the many owners of the house centuries later as a joke, around which grew a myth. We spent a long time in front of a long white board. It tracked in detail the main events and tribulations that Petrarch went through in his time on Earth. For Laura – the woman that inspired his poetry – a short line had been reserved. He had met her in a church in Avignon and fallen deeply in love with her. No-one knows for sure who she was, said the board. In contrast, the names of Petrarch’s many friends and benefactors and his dealings with them were described in some detail. Apparently, the poet had a son. With whom, the board didn’t know. Later on he had a daughter and this time the board just quickly noted that it was by a woman of whom nothing is known. I found this a little sad. I would have liked to know more about the women who were in different ways so close to him. I gather though that this would be the eternal mystery on which the appeal of his poetry still stands. Every woman reading Petrarch’s sonnets can feel them like they were written for her: the pure L’aura who captivated the heart of a man. At this point and looking into the sunset, I start to imagine what happened next: perhaps, in a parallel universe she loved him back, they did get together and she bore him a daughter and a son. And this would have been the happy Hollywood end, but would it have inspired a life dedicated to poetry, writing and books? Would it have given Petrarch the spark that ignited the Renaissance? After some thought, I decide that there is no need to speculate. I look one last time into the sunset, take a breath of Italian air and we quietly go home.